Blazon: A three-headed Hydra Gules and Vert. Link: Hydras in Greek mythology were famed as being the most difficult creatures to destroy. Motto: Latin: Ad finem – To the end. History: Formed Cattewater August 1918 Renumbered No 10 Sqn 4 October 1948 NB. 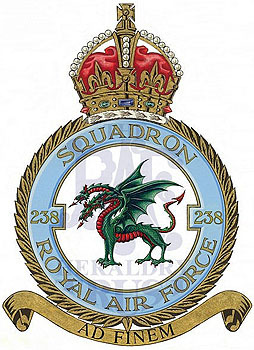 Reformed after page was completed by renaming the Line training Flight at Cosford in 2007- Current at time of artwork.